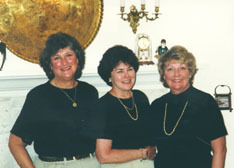 "I had such a fun week with Bobbie and Sylvia Adkison (& husbands). We never stopped talking and sometimes laughed until we cried. There is something so mystic about that time in Turkey (1958-1960). To be able to meet someone after 39 years and feel that closeness of a dear, dear friend that you can discuss life's secrets with, is a treasure that most people could look for all their life and never find. We started with dinner at my house and just had a relaxing evening. 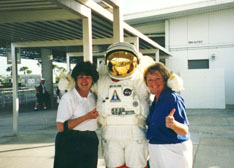 The next day was spent at the Kennedy Space Center. The tour at KSC was excellent. What marvel outer space holds and we were impressed and in awe of it all. The next day we spent the day on the beach. We talked, laughed and didn't use enough sun screen and ended the day with sunburned bodies munching down on fish at Port Canaveral. We shared so much about our lives in this short time. My hope is that I remember it all as these senior moments seize my brain. If not, I know these long lost friends will forgive me and will tell others these memories once again in another place."